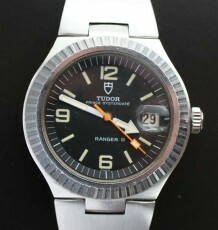 Rare 2 tone Explorer made in 1953. Honeycomb dial and milled gold bezel, all original. 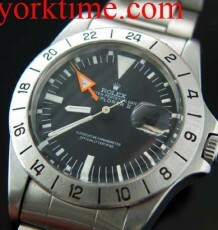 This vintage Rolex Explorer is about a crisp an example as you are likely to find. This model, reference 6299 is one of the large sized big bubbleback models made for the Canadian market in the early 1950’s. 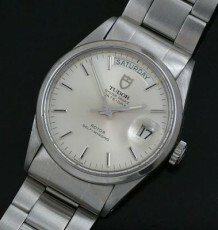 This watch dates to the 3rd quarter of 1953. 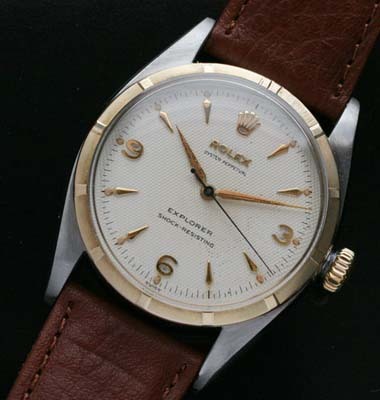 The Rolex Explorer gained fame with the public after is was associated with Sir Edmund Hillary’s historic climb of Mt Everest, which coincidentally occurred in the previous quarter of that same year. The all-original dial on this stunning watch is 100% original and features the highly sought after white honeycomb textured surface. 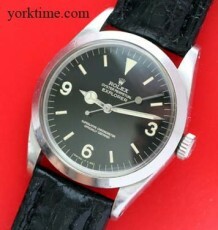 The text on the dial, includes the word Rolex in applied gold colored metal characters, while the words Oyster Perpetual and Explorer Shock resisting are done in black paint. The original gold dauphine hands are still fitted to the watch. The movement in the watch is the calibre A296 big bubbleback movement with only the adjustment lever for the balance regulation visible through the cover plate. The case measures 36 mm in width, the same as the other Sports model Rolex Explorers and the watch is supplied on your choice of black or brown leather strap.